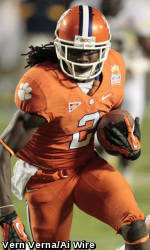 CLEMSON, SC – Clemson freshman Sammy Watkins was named a first-team freshman All-American by the Football Writers Association. The announcement was made just a few hours prior to the BCS National Championship Game between Alabama and LSU. Watkins, who was named a first-team AP All-American as an all-purpose player, finished the season with 82 receptions for 1219 yards and 12 touchdowns. He established Clemson records for receiving yards and receiving touchdowns and his reception total was second best in school history (88 by Aaron Kelly in 2007). Watkins also finished the season with 2288 all-purpose yards, second best in ACC history. C.J. Spiller’s 2680 yards in 2009 is the only total higher. Watkins was the first freshman in his first year in residence in ACC history to be named a first-team AP All-American and the first at any school since Oklahoma running back Adrian Peterson was honored in 2004. Watkins, who was also named the National Freshman of the Year by Sporting News, led all freshmen nationally in reception yards, touchdowns and all-purpose yards.